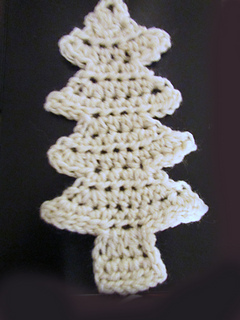 These are small, compact trees and as such, details make the difference. 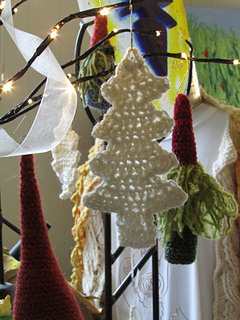 While initially conceived of as ornaments for light trees, they may serve as bookmarks, appliqués or embellishments, and be small toys if two are made sewn together and stuffed lightly. These are four tiers. You could skip tier three and make it 3 tiers. 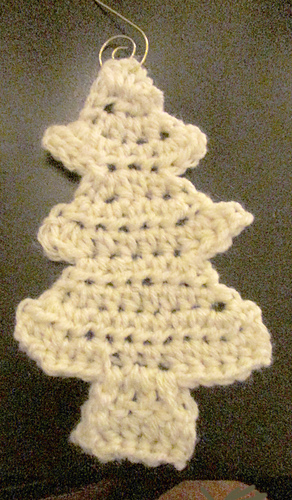 Use any hook/yarn combination you choose, making sure the hook is a bit smaller than that recommended for yarn: work a bit looser than amigurumi but tighter than that used for a wearable. 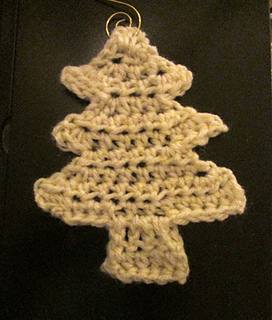 Using aran weight yarn and G/4mm hook, my three-tier tree was 5” long/ 12.7 cm and 4.5”/11.4 cm at the widest. 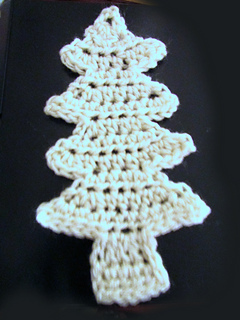 My 4-tier tree was 7” long/17.8 cm by 4.5”/11.4 at the widest (my tension is relaxed, so maybe a H/4.5mm if you tend to work tight). Blocking changes proportions dramatically (you may lengthen or shorten this, depending on how assertively or relaxed you block, or don’t block). This is very fast -- ten to fifteen minutes once you get into its rhythm. I will make some in ww wool and amend these notes to include size results. 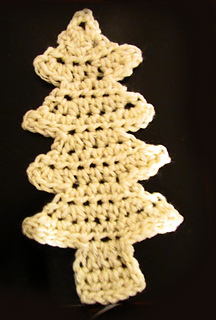 I want to release it while folks have holiday time to make a few for their holiday decor.